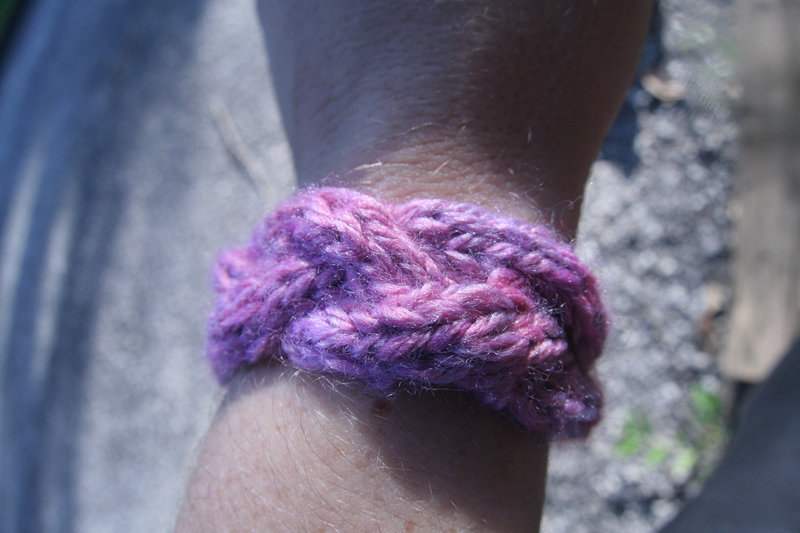 Keeland is Gaelic for little and slender, the perfect description for this his cabled bracelet. Keeland is also extraordinarily versatile and can easily be turned into an anklet, necklace, headband or even straps for a bag. All you have to do is keep repeating the cable pattern until the desired length is reached. Instructions are included for a 2 and 3 cable braid. For detailed instructions on how to create a basic cable please read this entry. Written pattern is available after the jump. Since everyone is shaped differently it is best to measure your wrist (ankle, neck, head etc.) and knit to that length when the piece is pulled tight. Attach button at CO end, then weave in ends. You give abbrev.’s but no descriptions on how to do your cables. Stating 4-st Right Cable doesn’t tell the knitter anything. Are you expecting everyone to know how to do a 4 stitch Right Cable??? please see the linked entry on how to create basic cables. This entry is also linked in the body of the pattern for my readers convenience.